We created two new features for you. With Fanpage Karma Publish, you can now mention other profiles in your Instagram posts and tag them on pictures. In order to create a mention on Instagram, you only have to insert a “@” in the text field of the poster add the profile name. This works similarly in Fanpage Karma. From now on you will find a new “Ad Mention” button below the text field of the post composer. Click it and type the profile name of the profile you want to mention into the emerging pop-up. Select the profile. The mention appears highlighted in the text field. You can add as many mentions as you wish. To mark another Instagram profile on a picture, click on the small icon on the top left. Enter the name of the profile you want to tag on the picture and select it. You can now place the tags by dragging and dropping. Add as many tags as you want. Mentions and tags are great ways to share your content with specific profiles. If you mention or tag them in your post they get notified and can now respond or share the post. Your content thus reaches more users. Let’s say you write about the rise of young fashion labels on your blog and create a post to alert your community. In your caption, you should now mention the brands from the article or mark them on your post. Their social media management team will be pleased to receive the attention, as you have given them free reach. It is quite possible that they react with a like or comment on your post or even share the article and thus help you increase your reach. In this way, contacts and cooperations can be established. It’s a win-win. Of course, this only works if the mentioned profiles can identify with the message of your post. 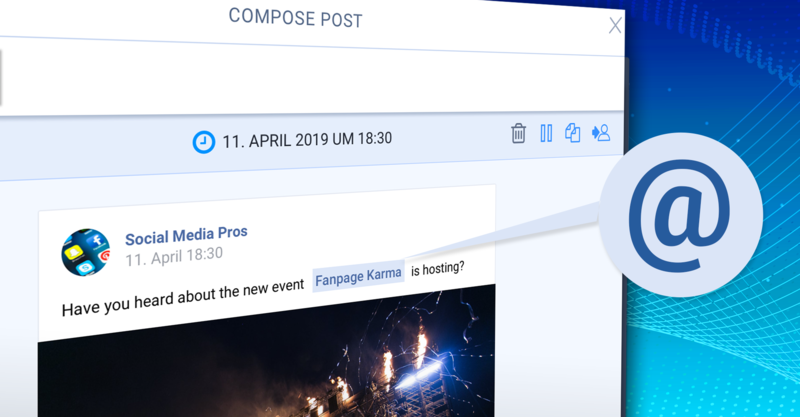 You can test the mentions, tags and everything else that Fanpage Karma has to offer for free for two weeks with your entire team.